The graph below is generated from popcon submissions. Since they include the version of the popularity-contest package, one can determine the Debian release that was used by the submitter (a new version of the popularity-contest package is generally uploaded just after the release to make that tracking possible). 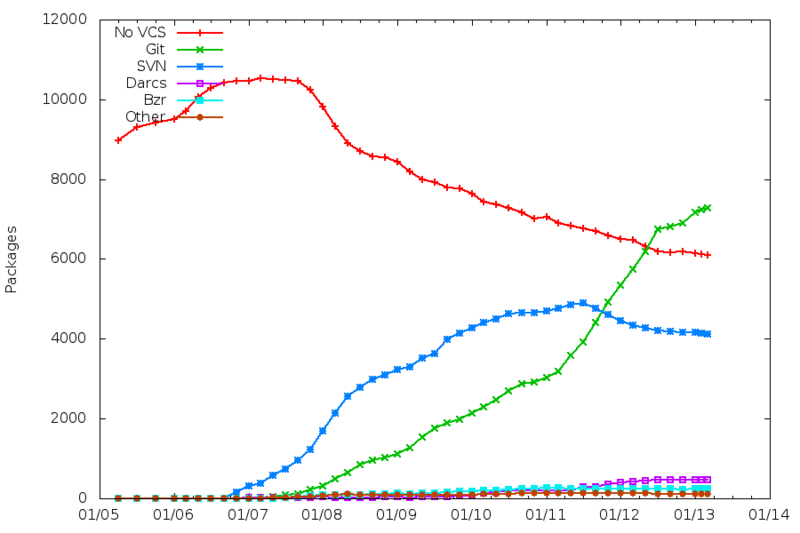 The graph is similar to the one found on popcon, except that versions newer than the latest stable release are aggregated as “testing/unstable”. 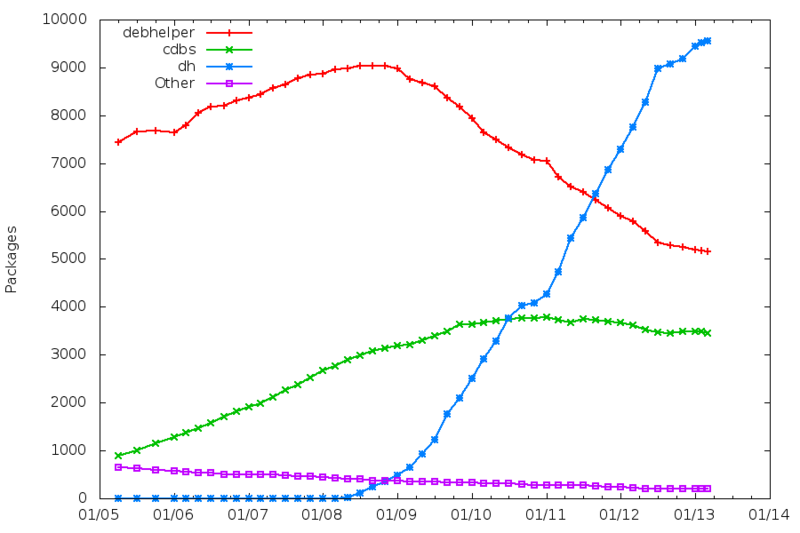 Popcon submitters might not be representative of Debian users, of course. 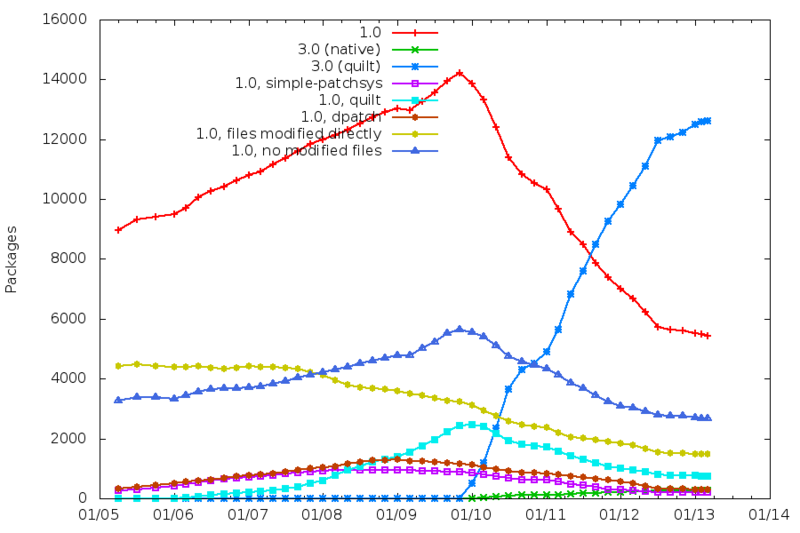 I don’t understand why the number of Debian stable installations does not increase, except when a new release is made. It’s as if people installed Debian, upgraded directly to testing, and switched back to tracking stable after the release. Or maybe people don’t update their systems? A more detailed analysis could be done by looking at the raw popcon data. Upgrading to the next stable release takes time. Looking at the proportion of users still using oldstable one year after the release, it would be better not to remove oldstable from mirrors too early. Scripts are available on git.debian.org. After one week of campaign on -vote@, many subjects have been mentioned already. I’m trying here to list the concrete, actionable ideas I found interesting (does not necessarily mean that I agree with all of them) and that may be worth further discussion at a less busy time. There’s obviously some amount of subjectivity in such a list, and I’m also slightly biased ;) . Feel free to point to missing ideas or references (when an idea appeared in several emails, I’ve generally tried to use the first reference). This list could be moved to wiki.d.o if others find sufficiently useful to help maintaining it. I’ve been playing with snapshot.d.o, which is a fantastic resource if you want to look at Debian from an historical perspective (well, since 2005 at least). 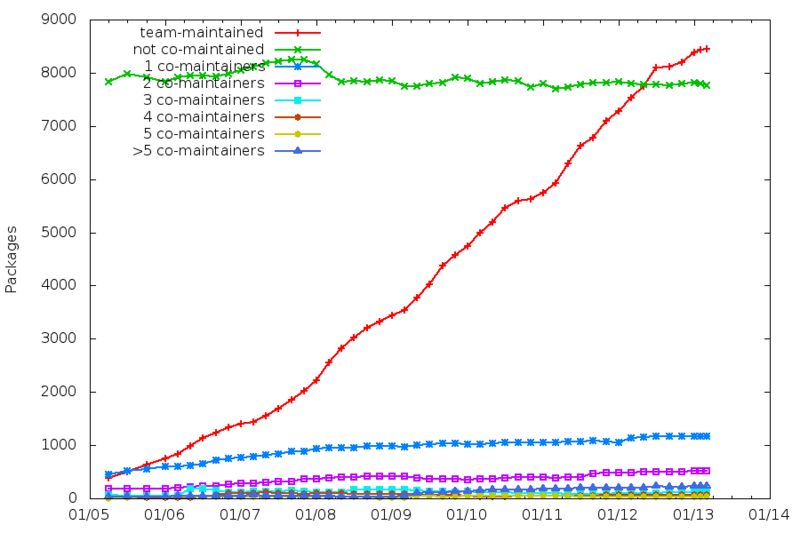 We now have more team-maintained packages than packages maintained by someone alone. Interestingly, the “small, ad-hoc group of developers” model does not really take off. A large majority of our packages are maintained in a VCS repository, with Git being the clear winner now. Possible goal for Jessie: standardize on a Git workflow, since every team tends to design its own? Again, we have a clear winner here, with dh. It’s interesting to note that, while dh was designed as a CDBS killer, it kind-of fails in that role. Possible goal for Jessie: deprecate at least pure-debhelper packaging? Again, clear winner with 3.0 (quilt). The (dirty) scripts that generate those graphs are available in Git (but you need to connect to stabile to execute them, and it’s rather time consuming — hours/days). Seriously, if you are a DD, you have the right to run. There’s no need for someone to nominate you. If you think that you could possibly say something interesting during the discussion period, and can spare the time to participate in the -vote@ discussions, please run. DPL campaigns used to be a great time where Debian visions, goals, politics and random stuff were discussed. The more candidates, the more interesting campaigns (8 candidates in 2007!). Also, there are already two three other candidates, so even if you don’t want the job, it’s not that risky.